Stoli® Vodka, the original premium vodka with uncompromising quality for the past 80 years, announced today the launch of their new global advertising campaign, “Loud and Clear.” The provocative new campaign features work from award-winning artists like composer Hans Zimmer, Lorne Balfe and director Rachel Morrison. 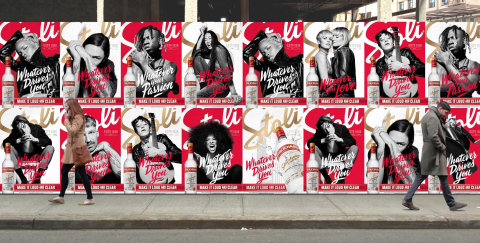 The campaign takes a 360-approach, incorporating television, digital, social and print to reveal Stoli®’s unapologetic message – whatever drives you, make it bold, make it last, make it loud and clear. Developed with FF New York, the global creative agency founded by Fred & Farid, “Loud and Clear” boasts an impressive lineup of award-winning creative talent who contributed to the campaign. “Loud and Clear” features music from the Oscar-winning composer, Hans Zimmer, and Emmy/BAFTA-nominated composer Lorne Balfe, which elevates the drama and emotion in the piece. Oscar Nominee Rachel Morrison served as the campaign’s director of photography on the video, which was shot by directors “We are From LA”. The print creative was shot by esteemed photographer Rankin in London and features the designs of graphic artist Tyrsa, who created a brand new font, Stoli Brush, for all of the print ads. The font will be made accessible for Stoli fans and consumers alike to download and use for free. For more information, visit www.stoli.com or follow Stoli Vodka on Instagram @Stoli, on Facebook at www.facebook.com/stoli and on Twitter @Stoli.